The architecture behind the Intel Silvermont system-on-a-chip could help the semiconductor company take on the mobile CPU space currently dominated by ARM processors. That's because this 22-nanometer successor to the Saltwell microprocessor is being rebuilt with mobile technology in mind, specifically power-critical smartphones and tablets. 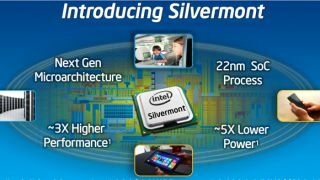 Intel estimates that Silvermont will be able to provide about three times the peak performance as Atom processors like the Z2580. Alternatively, the new SoC will be able to achieve roughly the same performance as current-generation Atom processors at 5 times the lower power. Silvermont, the first Intel chip to employ the next-generation low-power microarchitecture, won't be the last, according to Dadi Perlmutter, Intel executive vice president and chief product officer. "Early sampling of our 22nm SoCs, including 'Bay Trail' and 'Avoton' is already garnering positive feedback from our customers," said Perlmutter in a press release. "Going forward, we will accelerate future generations of this low-power microarchitecture on a yearly cadence." Intel's commitment to yearly refreshes of its mobile-focused technology is already in the planning stages. This includes a 14nm processor codenamed Airmont with a release date expected in 2014. With Intel Silvermont promising architecture that delivers industry-leading performance-per-watt efficiency, the semiconductor company may finally be able to make headway with its Atom processors.